This is the third of three posts about the ancient Hebrew prophet Micah, based on sermons I preached at St Brides Liverpool. This one is about what we mean by peace. It focuses on Micah’s vision of everyone sitting under their own vines and fig trees, with no-one making them afraid. It is a vision of peace and satisfaction, the kind of situation people long for when they are in the middle of a war. but they shall all sit under their own vines and under their own fig trees, and no one shall make them afraid. So we are invited to imagine that we can all sit outside, on a summer afternoon, in our own garden, next to our own vine and our own fig tree. Nobody is afraid; it sounds as though Micah has forgotten about wasps. The point of this picture is that you produce your own, nobody takes it off you, and you are content with what you have produced. You don’t demand more. This image, of everyone sitting under their own vine and fig tree in peace, occurs in one other place in the Bible. It’s a description of the reign of King Solomon. Solomon lived before Micah, but the story was written after Micah’s time. When the author refers to vines and fig trees, he’s quoting Micah, but means the opposite of what Micah meant. It’s 1 Kings 4:20-27. Judah and Israel were as numerous as the sand by the sea; they ate and drank and were happy. 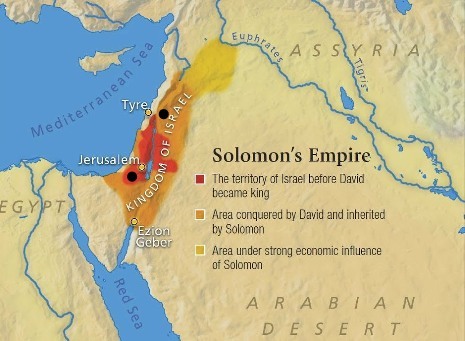 Solomon was sovereign over all the kingdoms from the Euphrates to the land of the Philistines, even to the border of Egypt; they brought tribute and served Solomon all the days of his life. ten fat oxen, and twenty pasture-fed cattle, one hundred sheep, besides deer, gazelles, roebucks, and fatted fowl. His daily provision! In other words, he was very rich. For he had dominion over all the region west of the Euphrates from Tiphsah to Gaza, over all the kings west of the Euphrates; and he had peace on all sides. Gaza is where it is now, about where the l of Jerusalem is on the map. Nobody knows where Tiphsah was, but it must have been close to the Euphrates in that orange splodge. If you see on the map where the Euphrates goes, you can see that describing his empire as ‘all the region west of the Euphrates’ makes it sound a lot bigger than it was. 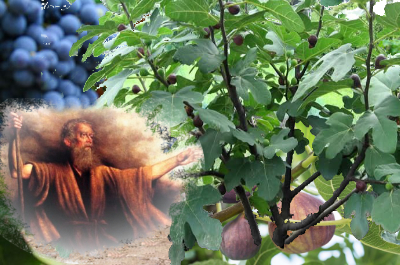 During Solomon’s lifetime Judah and Israel lived in safety, from Dan even to Beer-sheba, all of them under their vines and fig trees. Solomon also had forty thousand stalls of horses for his chariots, and twelve thousand horsemen. I’ve marked Dan and Beer-Sheba with black spots. Dan is the one in the north, just east of Tyre. Beer-Sheba is south-west of Jerusalem. In other words, those peacefully under their vines and fig trees were the core state, not the whole empire. This is obviously peace for Israel by means of taking peace away from everyone else. The Old Testament scholar Walter Brueggemann makes an interesting comparison of these texts. He says there were two economic systems in the ancient world. In one, some people enjoyed surplus wealth at the expense of others. In the other, everybody produced and consumed their own wealth. The poet sees that there will be no personal well-being, i.e., unterrified, until there is an end to the public policy of war. The mad pursuit of security by war, the mad pursuit of energy for weapons, the reliance upon imperial administration of resources, all that must be dismantled in order for the personal dream to come true. Obviously, there can be no such personal well-being as long as there is war and threat of war. But what denies that personal hope is not simply hostility and the threat of hostility. Rather, the main threat to “vines and fig trees” is the economics that sustain and require war. What usurps vines and fig trees is not just invading armies, but the tax structure and the profit system which are both cause and effect of military dangers. The poet envisions not simply a cessation of war, but the dismantling of the war apparatus… Thus this may be an idyllic vision, but it contains political realism at its center. The oracle offers not only a grand dream, but a realistic hint of what is required… The arms serve primarily either to usurp what belongs to others, or to guarantee an arrangement already inequitable. The arms cannot be given up without abandoning swollen appetites as well. To put it another way, if you and I are to live in peace, enjoying our own vines and fig trees, there are two ways to make it happen. Solomon’s system is to use force to benefit ourselves at the expense of other people, who will not be allowed to enjoy their own vines and fig trees. Micah’s system is to limit our expectations, so that our own peace and security is consistent with everyone else’s peace and security. Brueggemann is an American. Commenting on the situation there, he says the people with the most intimate dreams of personal vines and fig trees are the ones who make the demand ‘Get the government off our backs’. Yet these are also the people who hold most passionately to a war system to create an umbrella of security. It’s a contradiction. An elaborate system of military defence can only exist by confiscating the very thing it claims to protect. Brueggemann also makes a point about the beginning of this passage from Micah. It’s about what kind of god the people need to believe in. and shall be raised up above the hills…. and shall arbitrate between strong nations far away. Micah’s point will have been the opposite. He was taking part in a debate. Was the god of Israel a god of war, like the national gods of all the other nations, as Solomon believed? A God who wanted Israel to be successful at the expense of other nations? Or was the god of Israel different, a god of peace for Israel by means of peace for other nations as well? If, as Micah believed, Israel’s god was a god of peace, then the way to get it was to dethrone all the warmaking gods of the other nations. 1) What are the gods of Britain today that need to be dethroned? 2) How would you feel about having a patch of land where you grow your own food, don’t pay any taxes, and don’t benefit from anybody else’s taxes? 3) Could we be content with a society of equals, or are we too competitive? This entry was posted in Bible, Ethics, Politics, Society, Theology and tagged fig trees, Micah, peace, power, Solomon, vines, Walter Brueggemann, war. Bookmark the permalink.